An overview of Windows 10's event tracing functionality for Telemetry. A technical analysis on how Telemetry data is collected and processed. An analysis of the network interfaces and connections used to transfer Telemetry data. A look at configuration and logging capabilities to monitor and control Telemetry data collecting. 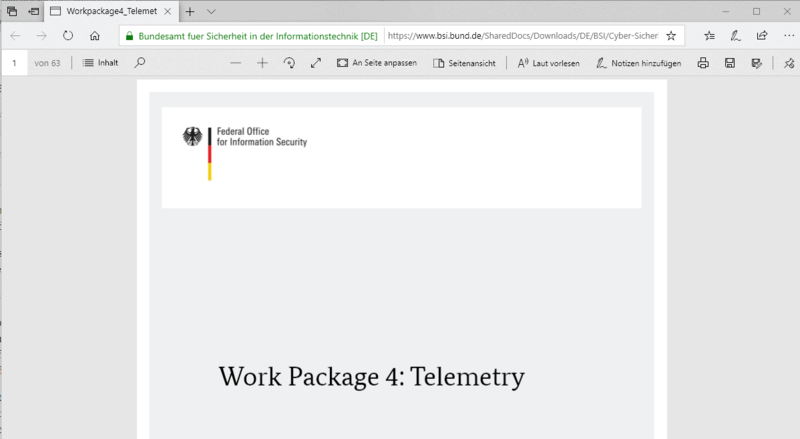 The report is quite technical in nature and the first couple of pages are only available in German at the time of writing. You may want to skip ahead to page 9, Executive Summary, if you don't understand German; the English part of the report begins with chapter 1.2. The report list hostnames and IP addresses that Windows 10's Telemetry service uses for communication based on a connection log of 48 hours. Here’s hoping Chrome OS grows into a good replacement OS for general use. They steal your data too, but at least it will be pretty and efficient. In the meantime I’ll roll distros. Neat. LTSB1607 does have its bugs which will never be fixed, but it’s as good Windows 10 will ever get. It is a fairly low standard in of itself, though. Germany is undoubtedly very concerned with Web privacy and I’d appreciate France be as much. One thought for those who run Windows 10 out of the box, which are the vast majority of users : “Imagine there’s no tracking, it’s easy if you try…” when these users aren’t even aware of the tremendous amount of their privacy withdrawn by Microsoft. If you think about it, it’s really a scandal. If you’re thinking of something like user privacy and protection that’s a misinterpretation. They just don’t like the data flow is goldmined in the US and not so much under their own control – which they’re working on, as you can see. Totally agree. That’s the truth about Germany, the EU, and even the GDPR. > Germany is undoubtedly very concerned with Web privacy and I’d appreciate France be as much. As a native German, I believe that the reason is that there existed two surveillance regimes on German soil in the 20th century. One of these two just ceased to exist less than 30 years ago (and the memories are thus still quite alive – in particular in East Germany). And every evening, there is some transmission in German public service television that reminds people that the other surveillance regime existed. So is should not be far to seeek that there exist lots of people in Germany that are quite concerned about privacy and surveillance. Definitely true, as a foreigner living in Germany you definitely see a big difference when it comes to web privacy. One thing I found surprising is that many German people will use nicknames on social sites like Facebook as to not reveal their identity online. That’s not terribly rare in the US, either. Of the people I personally know who use social media, including Facebook, over half do so using a pseudonym. It’s not always obvious that a pseudonym is being used, though — they tend to be like my “John Fenderson” pseudonym here: a fake, but plausible-sounding, name. the other nice thing about 1607 ltsb is that you can really cut it down, I’ve got mine down to 39 processes vs like 150 for pro. Could you post a guide on how you managed to do that? Would be interested in reading and trying to recreate. Well it is a combination of stuff and what works for me might not work for you. Basically I go through all the services with black vipers guide and disable all the tasks with like ccleaner or glary utilities, then go through everything in autoruns and uncheck everything I do not need or use. I think that’s about it. I also like this new wpd program for quickly doing alot of the privacy and telemetry stuff. The nvslimmer program is great too for stripping out all the crap from nvidia drivers. Last thing is go through everything in gpedit and set accordingly. I like speed over functionality, I am sure there is stuff broken but none of it affects what I do. I tend to use wsus for my updating, from what I can tell with 1607 ltsb it does not matter if you use security only updates or not as I have not seen a difference with 2 diff machines also I let a 3rd box just update with windows and it had then same updates as wsus boxes..
You would think with all the telemetry gathered Windows 10 would be a much better OS stability wise then it is. But you would be wrong and history says all this data collection is not having much benefit at all. Well, at least not for the end users. @John, if ” this data collection is not having much benefit at all.” it’s maybe because improving the OS (for a better experience!) it’s not it’s first aim. I can imagine other aims far less aimed at a better user experience. W10 seems to have the most telemetry of any version of Windows and yet it is the most unreliable and problematic version that I’ve used. Collection does not necessarily mean it will be analyzed. I think we can all agree that that’s largely the problem with Microsoft, hell with many big tech companies. If they’re collecting vast swathes of data points, at the very least use it for legitimate improvements. I have to admit, while great effort, I wish this analysis was made by an independent international organization. Mostly as I’m not looking forward to yet another per continent censored version of Windows. Also, I wonder if they would be able to repeat these tests and have mostly identical results. Which appear to be quite different from the ones recently updated by Microsoft. @Cor, the German BSI is doing its job but indeed there is quite a lot of sleeping otherwise. There is no international consensus regarding these major Web companies as there is none all the same regarding the power of banks. Power nowadays has made its way far from democracies’ economies and even justice. And most media, in France anyway, get along with it,, hardly evoke Google’s reluctance to honor GDPR correctly and Microsoft’s refusal of rethinking an OS entirely based on advertisement and tracking. It’s up to each of us to try to be lucid and honest. Revolt sometimes blinds but naivety as well. Couple what Win 10 does with what Google, Facebook, and all the other “technology companies” do and it’s no wonder that people are starting to get concerned. Unfortunately, we are at a time in historical development where technology has outstripped the ethical and legal constraints that are in place. It will take a while but hopefully things will get back in order. Analogous situations have occurred in the past. For example the “Robber Baron” era in the United States where the Robber Barons didn’t actually break any laws because there were no written laws at the time that fit what they were doing. And the need to break up the monopolistic practices of some of the pioneering companies that happened a few decades later. Examples of which were the breakup of Standard Oil and AT&T. Hopefully our various legal entities enact appropriate legal constraints and the sooner the better. THIS is the reason I do not use Windows 10 – telemetry. Well! Telemetry has been part of Windows for ages and Windows XP was already calling home 24/7. Telemetry was nothing like the avalanche it is today, and we could choose to disable it if we did not want to participate. @WasHere: The difference with Windows 10 is that you can’t disable the telemetry. Here at Microsoft we take our users’ privacy seriously. After decades of selling sporadically functioning software, we’re happy customers are delighted if a particular update works; delighted they will still remain customers after experiencing update sadness if their device is trashed. A recent set of user focus groups led by a notable marketing firm specializing in aiding Silicon Valley app “developers” sell their lame start ups to Silicon Valley V.C.’s with too much money, concluded that almost all of our Windows users are so absorbed by phone culture, we can track with impunity, everything interaction they have with Windows. We thank Google and Apple for effecting the global mindset shift that made privacy soooo last centurayyy! Ads are where it’s at! Ads allow MS to play, too, in privacy commerce. We joyously watch money flow back and forth among Valley tech companies. The bubble is warm and sunny. It’s OK customers get nothing; they’ve tacitly allowed us to collect their every thought through a decade or so of smartphone use. Who’s the smart one there, the phone?! Yes, at Microsoft we value our customers and are very serious about taking their privacy openly and surreptitiously. That’s one way we make money; our customers and all their contacts work for us free and they should because we’re so smart! I want Win NT 3.51 back. It worked. It was designed by adults. Who apparently died and left MS to a bunch of kids with helicopter parents. By Win 2000 with the Dr. Seuss interface (because Macs had it, bah! ), the end was near. How about the data collection and tracking Defender, Cortana, Edge, and Bing are doing? Microsoft 1809 can even upload your files to Microsoft’s “cloud” without your consent if they choose. Windows 10 has zero security. It’s likely that M$ is in cohorts with the NSA/CIA when she imposed forced auto-collection of Telemetry & Data in Win 10 in July 2015, purportedly for National Security reasons, eg to secretly track terrorists online. ……. M$ has even backported this “service” to Win 7/8.1 through sneaky Telemetry updates & Patch Rollups since the end of 2015. By cooperating with the US government, M$ is given much immunity and favoritism by the govt, eg from Federal anti-trust and consumer class-action lawsuits.